The NVQ Level 3 in Electrical Maintenance is completed in your own time using our e-Portfolio system, OneFile. Your assessor will also carry out remote on-site assessments with you and these assessments will contribute towards the completion of this NVQ. This means that you can complete this NVQ as quickly as you wish providing you have the necessary evidence to do so. The qualification consists of seven units and each unit needs to be complete over three separate occasions. This can be any number of jobs / tasks and does not necessarily mean three separate jobs or three separate locations. The additional unit 399 (AM2) needs to be covered only on one occasion and this is a three day practical assessment taken at an AM2 Centre anywhere in the UK. This unit is for: You if you diagnose and correct faults in electrotechnical systems and equipment, and need to take appropriate action. This unit is about: Confirming that your work, tools, plant and materials meet requirements and that the working conditions are safe for work to commence. This unit is about: Following agreed procedures when carrying out maintenance activities on electrotechnical systems and equipment. • record your findings in accordance with organisational requirements. This unit is for: You if you inspect, test and commission maintained electrotechnical systems and equipment. This unit is about: Carrying out the process of inspection, testing and commissioning in a safe manner and in the correct sequence to comply with the latest Industry Standards and regulations. • inspect, test and commission the maintained electrotechincal systems and equipment in accordance with approved procedures. • carry out an accurate handover of the maintained electrotechnical systems and equipment. • keep good records of the procedures and results. 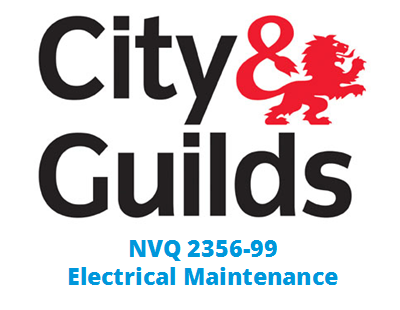 Start Your NVQ 2356 Level 3 in Electrical Maintenance NOW!